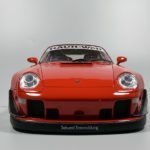 We reviewed the Green Monster, the GT Spirit RAUH-Welt Begriff (RWB) Porsche 911 (964) back in February. 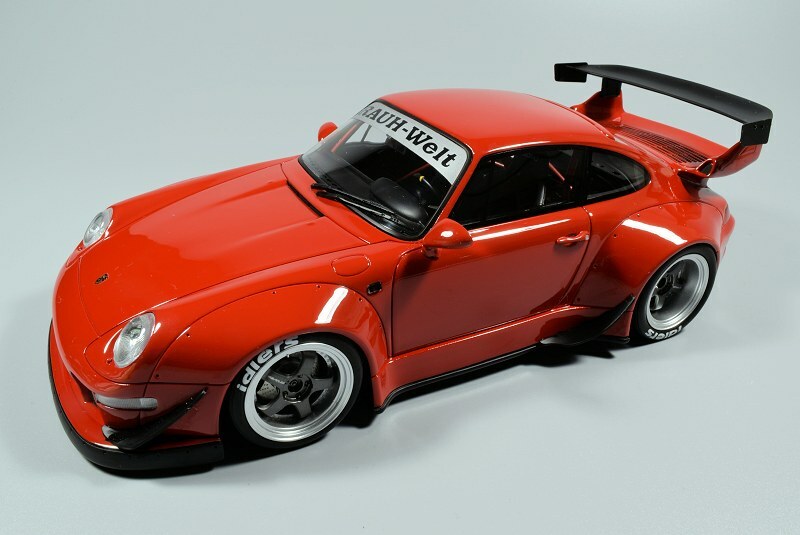 This month we have the new, limited edition of 504 pieces GT Spirit RAUH-Welt Begriff (RWB) Porsche 911 (993) in Red. 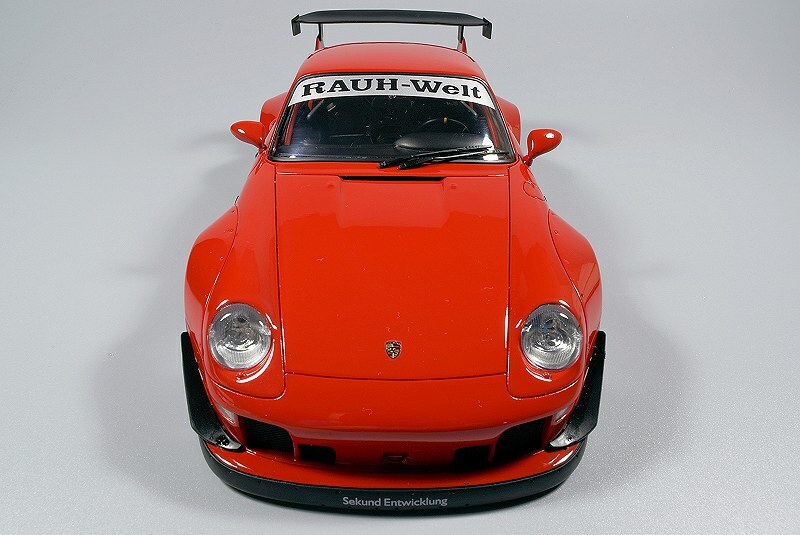 This special edition was sold exclusively via Modelissimo, Little Bolide, and CK Model Cars. 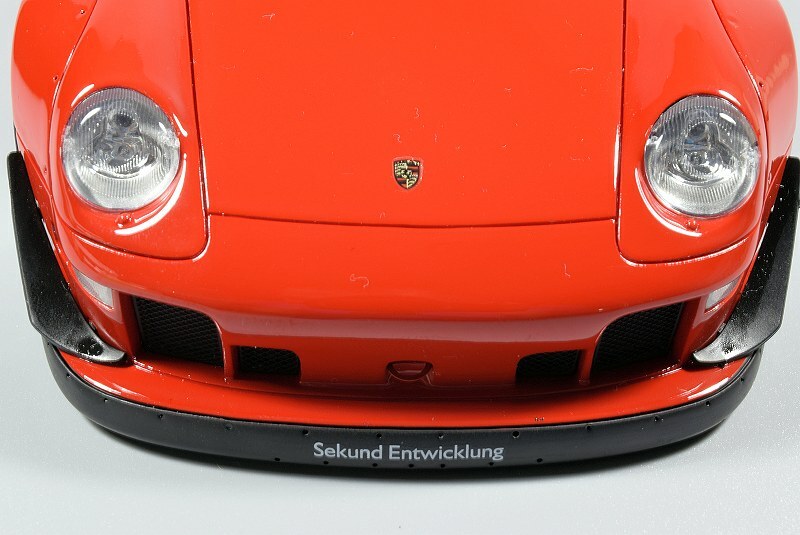 It originally listed for 99.95 Euro, and due to popular demand the price slowly escalated throughout the day. If you can find one now, the price will surely be north of 200 Euro plus. 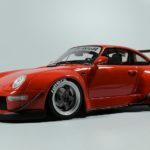 The RAUH-Welt Begriff (RWB) Porsche 911 (993) is similar in execution with its older brother the 964, the review for which you can read HERE. 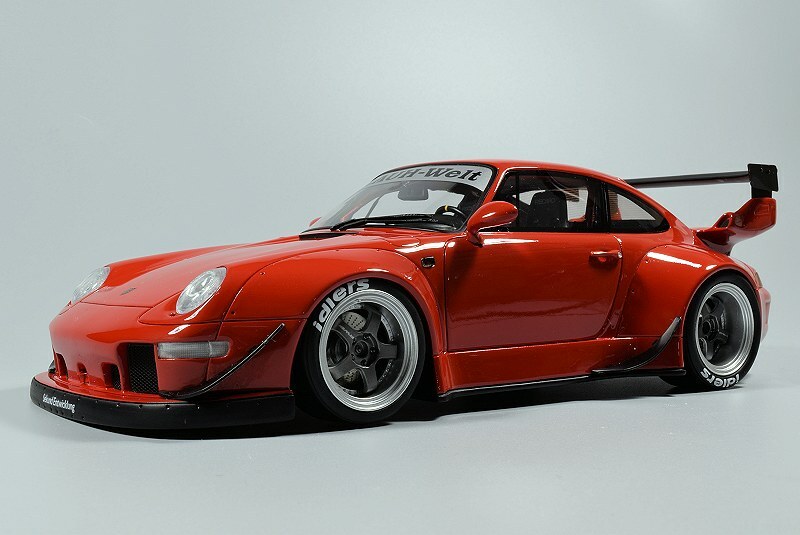 So, will the 993 live up to the hype? Read on. 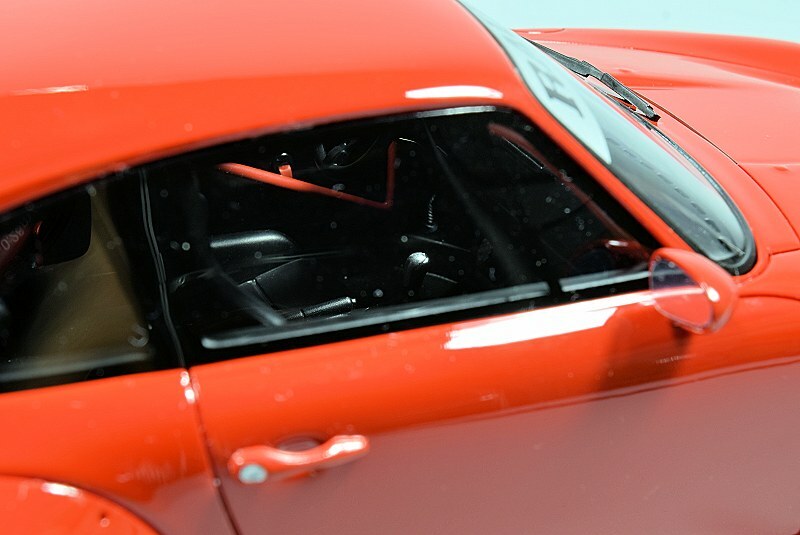 If you are familiar with the GT Spirit brand, you already know their models are 100% sealed and completed in resin. 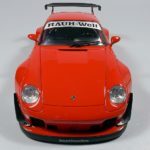 The hobby version of the RWB 993 was painted Green, and just recently a Purple was added to the assortment. 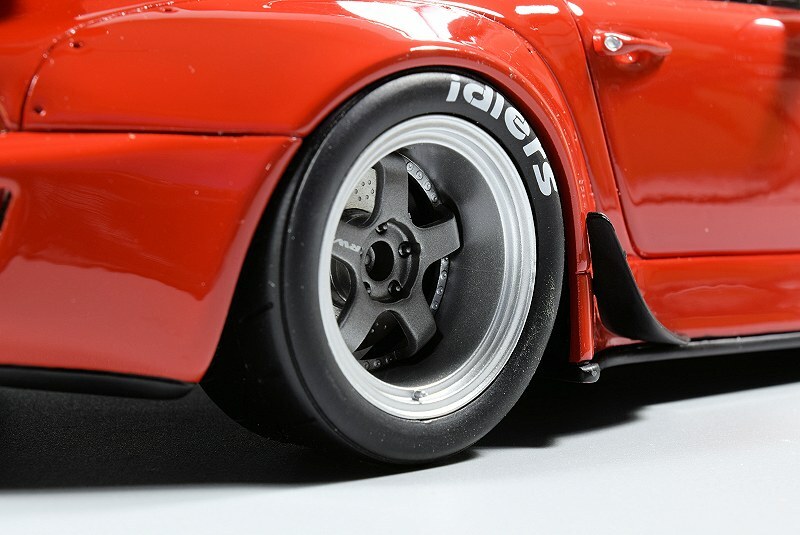 The model here features a Red and Black paint combination that works very well, better than the Green in my opinion, due in part to the two-tone wheels. More on the wheels later. Paint work is excellent, the accompanying black accent bits are done in the same fashion. As with all resin models, shut-lines and panel gaps are excellent, though a little more finesse with the lower side fins would have been a better move, you can see light coming through the gap on both right and left sides. Also, some of the finish on the lower door section could have used a little more sanding too. The front section of the model does feature perforated grilles in all positions, which we like. 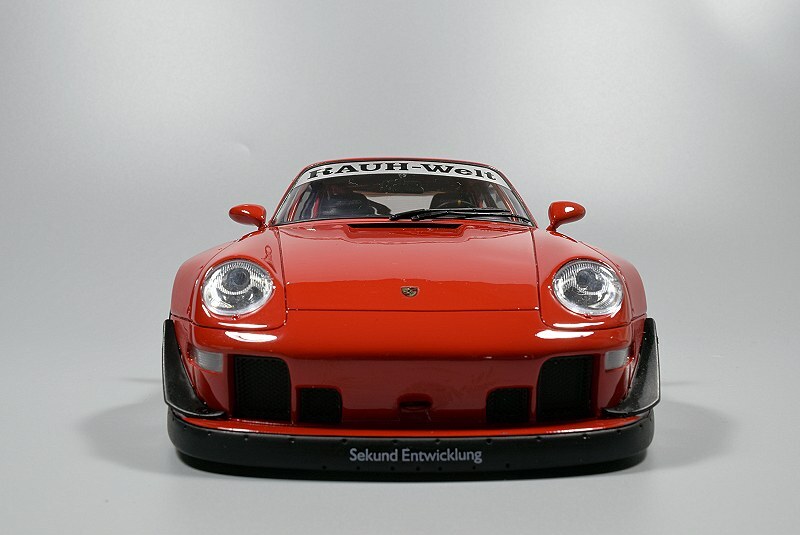 The lower chin spoiler is almost scraping the floor (as all cars should LOL) and the decal, “Sekund Entwicklung” or “Secondary Development” sits front and centre, a RWB trademark of sorts. Headlight and turn indicators are nicely detailed too. 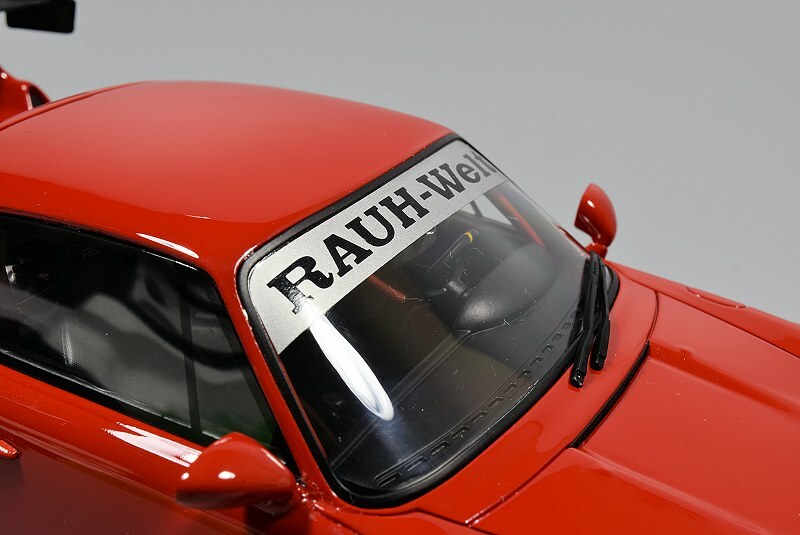 Finally we have another RWB trademark decal, the banner across the front windshield “RAUH-Welt”, which is applied nicely. 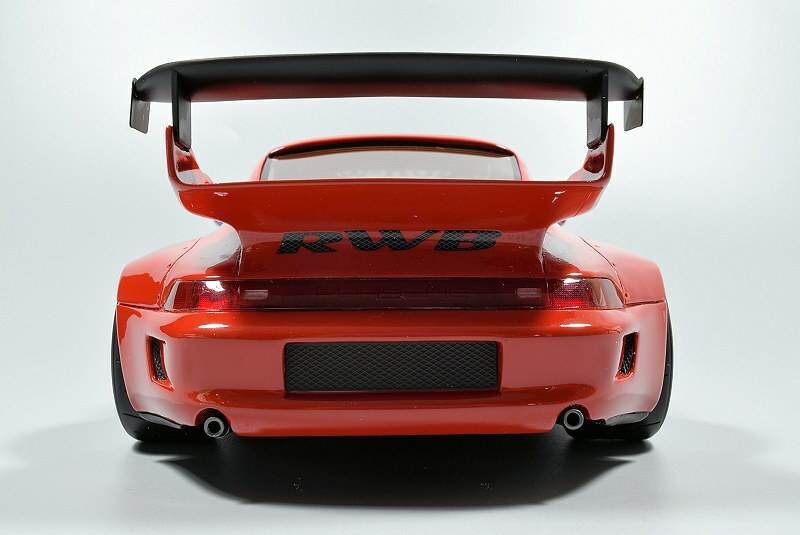 The rear showcases the massive dual wing spoiler, which is huge, like everything else about this car! 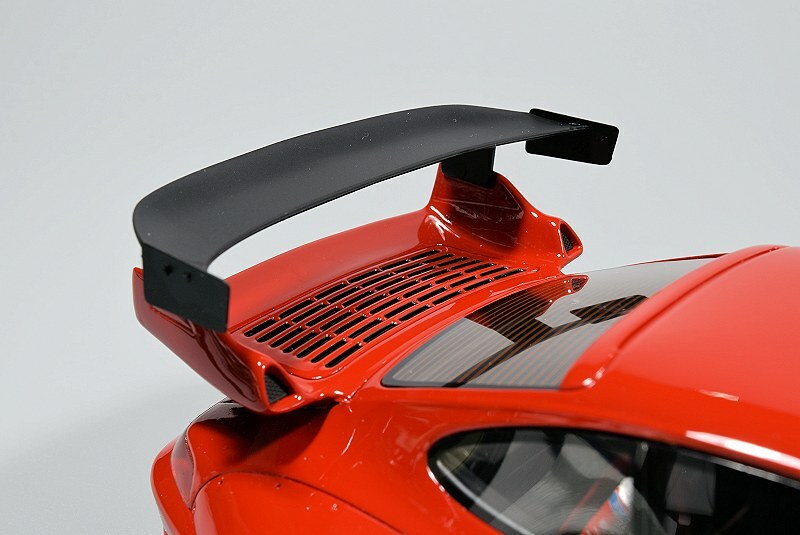 One thing that seems odd is the two small exhaust tips. I assume replicated to scale based on the 1:1? There are no perforated grilles on the three areas as shown in photo. 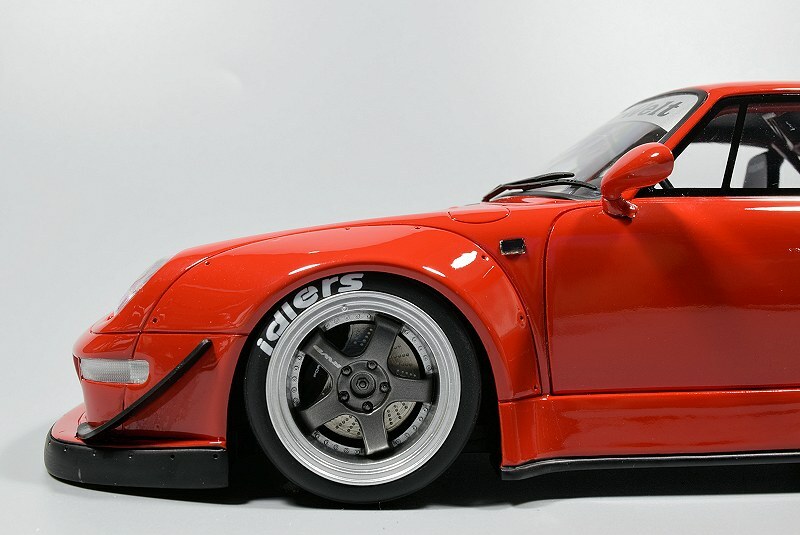 The wheels on the RAUH-Welt Begriff (RWB) Porsche 911 (993) are excellent. I personally love the gunmetal centres with silver outer section. 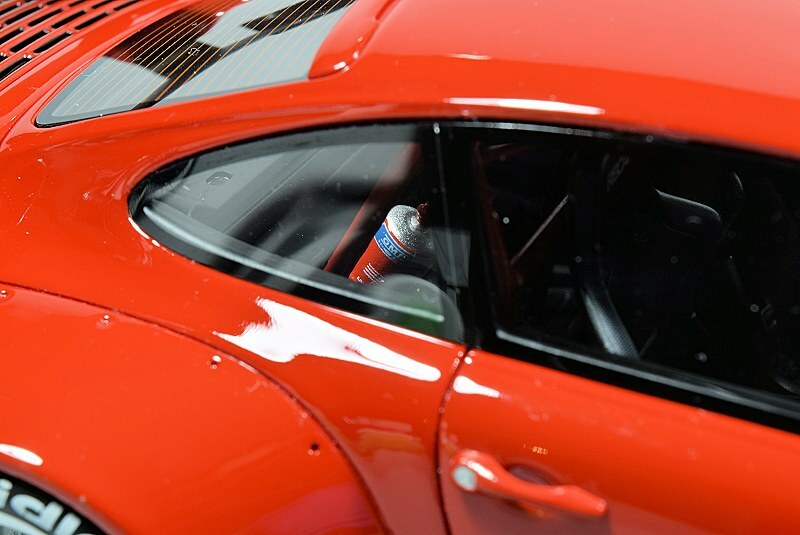 The combo works with the deep Red exterior paint. The inner workings of the brake calipers and rotors are crafted with care, and drive the realism of the entire package. 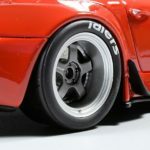 And the “idlers’ tire branding is definitely the icing on the cake! 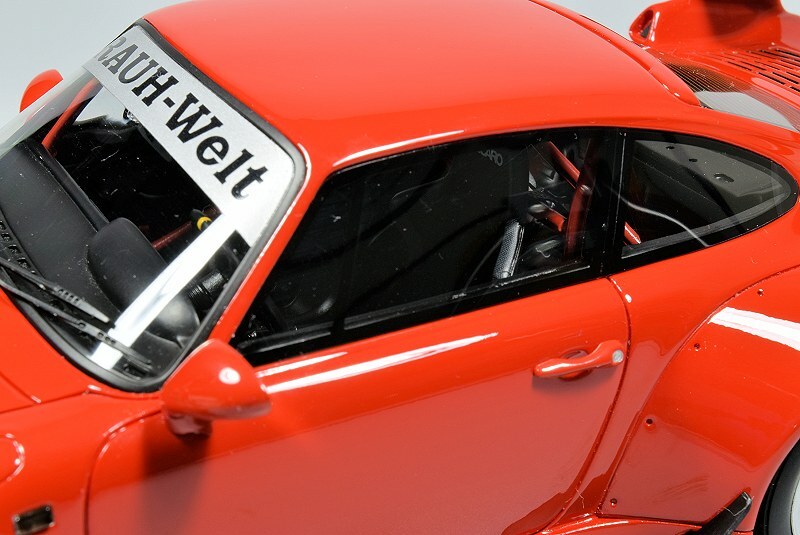 The interior of the RAUH-Welt Begriff (RWB) Porsche 911 (993) isn’t too fancy but it gets the job done. 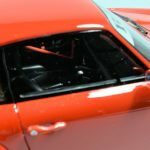 Inside we have a mostly black interior with red roll-cage along with various other bits that breaks the monotony of the black colour. There is the added fire extinguisher and fabric seat-belt harness for the driver side only. I do apologize in advance for the poor images, still trying to grasp the new photo apparatus and technique. For the price of 99 Euro (this includes VAT) the model is a true gem, a very unique piece amongst many mundane pieces of the current day. Overall execution here is very good. If I could change one thing, it would be diecast over resin. 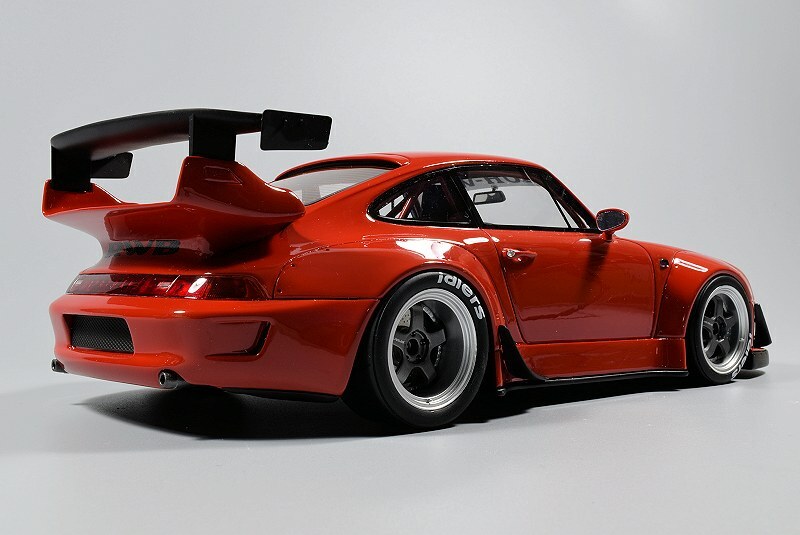 For Porsche fans, some may gasp at the car and other will embrace it. 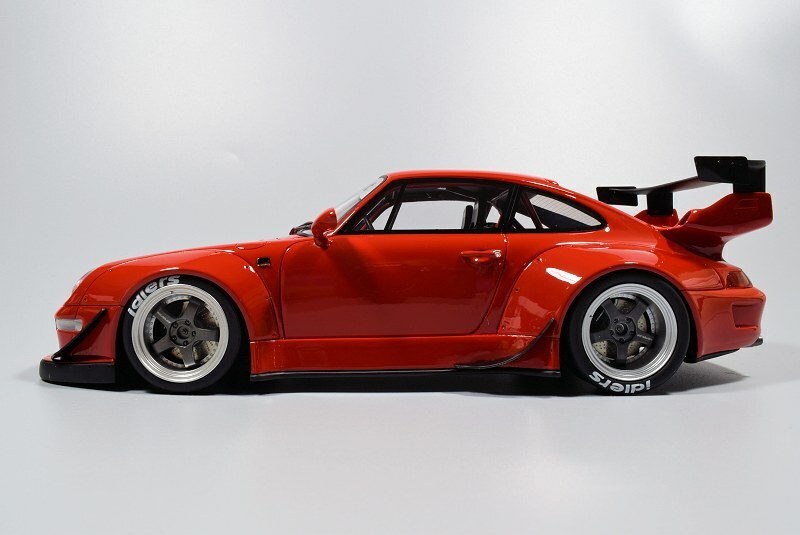 I’m one who chooses to embrace the creativity and passion behind each RWB piece. One cautionary tid bit for GT Spirit, moving forward, possibly add a new colour, but PLEASE move away from Green and Red! Also you should enable MAPP pricing to encourage fair play among retailers. Enjoy the pics! 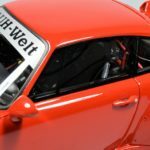 4 Responses to "REVIEW: GT Spirit RAUH-Welt Begriff (RWB) Porsche 911 (993)"
Yes the wheels will turn, not easily but with some finesse they will. I like to the buy this model send me more inf.